Keesing Technologies launches Photometrix, a new product with which the user can create a unique 2D barcode to use on any identification product. This barcode contains a template of a valid photo of an ID document and personal information such as a name, date of birth etc. This way, Photometrix offers companies and organisations a way to create a reliable and spoofing-free (digital) identifier for its customers, visitors or employees. 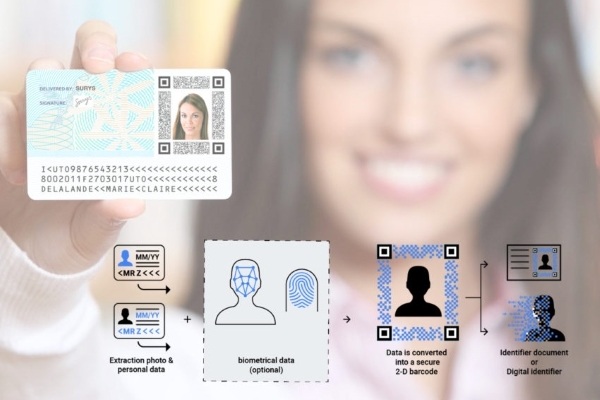 Photometrix uses a specially designed algorithm to convert the photo of a valid ID document into a secure template. Together with someone’s personal data (name, date of birth), this template is then stored into the Photometrix 2D barcode. The data in the barcode is encrypted and secured. Once encrypted, the 2D-barcode is ready to be issued. You can now opt to issue a physical or digital identifier (or both) including the 2D-barcode and a photo of the person to your customer. The 2D-barcode can be used in any personalisation process within your business, e.g. badges and ticket issuance. The use of (digital) identifiers, such as badges, tickets, photo IDs or other identification documents including a photo of the document holder, is becoming increasingly common worldwide. Businesses h these (digital) identifiers for their customers, visitors and employees to provide them access to certain (government) services, accounts, events or high-risk locations. However, photos and images on such (digital) documents can be easily tampered with. As a result, identity fraud simply based on the replacement of the ID picture on the document is on the rise and has caused severe damages to both businesses and individuals.